Cucina Povera: Oh Burr Jean! Are you Aubergine? 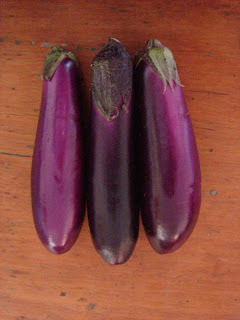 Or Eggplant? Here are some of the things I love about you. I love your smoky aroma. I love your soft, pillowy flesh. I love chopping you and tossing you in cumin and salt and olive oil and roasting you in the oven, and slathering hummus on you and eating you in a sandwich with fat juicy roasted Italian tomatoes, caramelised onions, sweet potato and a lovely thick slice of soft cheese. I love you Parmigiana style. I love you slow roasted whole and turned into Baba Ghanoush. I love you lightly crumbed and deep fried on its own just sprinkled with salt. The same thing happens every time I go to the market... You eye me from the produce section. I am enamoured by your beautiful colour... A vision in a delicious shade of purple. I can never resist you and your plump, exquisite rotundness. I can't walk away from you... Have you I must! And take you home and turn you into something delicious and exotic. In case you haven't noticed. I kinda like eggplant. Preheat the oven to 200c. Put 2 tablespoons of oil in a small roasting tin. Cut 1 bulb of garlic across the middle so that the cloves are cut in half. Put each half of the bulb of garlic cut side down in the oiled dish and add 1 large whole eggplant. Bake for 20 minutes, or until the garlic halves are golden brown and the eggplant is soft. Remove from the oven and allow to cool. With the tip of a small, sharp knife, separate the garlic cloves from the bulb and put them in a blender or food processor. Cut the eggplant in half, scoop out the soft flesh and add it to the garlic. Blend to a puree. Transfer to a bowl and fold through 4 tablespoons of tahini and 2 tablespoons of lemon juice. Season to taste with sea salt. Just before serving, fold through 2 tablespoons of finely chopped flat leaf (Italian) parsley and garnish with a sprinkle of cayenne pepper. Finish with a light flourish of Olive Oil. (If the thought of using a whole bulb of garlic seems a little excessive, you can just throw a few whole cloves with their skins on into the roasting pan). I am complex. I am demanding. I am sweet. I am salty. I am sometimes sour. If I were an animal, some say I would be a cat. I love my dogs. I love the sun, sand, sea and surf. I am a city lover who lives on the coast. I love the good things in life, as well as the simple things. I love anything unconventional. I want to travel and just be free and live life and love.